The taste for alcohol may be an ancient craving. 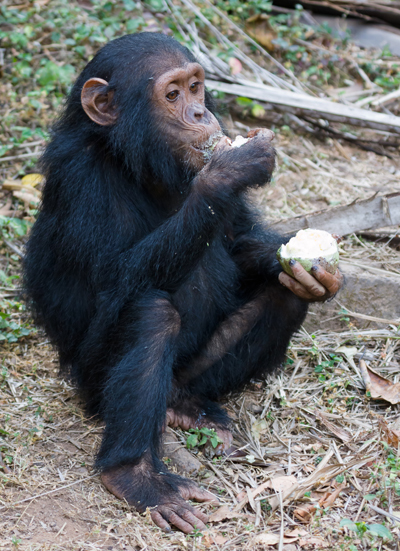 The ability to metabolize ethanol — the alcohol in beer, wine and spirits — might have originated in the common ancestor of chimpanzees, gorillas and humans roughly 10 million years ago, perhaps when this ancestor became more terrestrial and started eating fruits fermenting on the ground. Chemist Steven Benner of the Foundation for Applied Molecular Evolution in Gainesville, Fla., reached that conclusion by “resurrecting” the alcohol-metabolizing enzymes of extinct primates. Benner and his colleagues estimated the enzymes’ genetic code, built the enzymes in the lab and then analyzed how they work to understand how they changed over time. Benner proposed the idea February 15 at the annual meeting of the American Association for the Advancement of Science. Today, humans rely on an enzyme called alcohol dehydrogenase 4, or ADH4, to break down ethanol. The enzyme is common throughout the esophagus, stomach and intestines, and is the first alcohol-metabolizing enzyme that comes into contact with what a person drinks. Among primates, not all ADH4s are the same — some can’t effectively metabolize ethanol. To see how ADH4 evolved, Benner’s team read the stretches of DNA that make ADH4 in 27 modern primate species, including lemurs, monkeys, apes and humans. Then they mapped the DNA sequences on a primate family tree and inferred what the genes might have looked like long ago at points on the tree where evolutionary branches separated. The branching points represent extinct primate ancestors. Most primate ancestors wouldn’t have been able to metabolize ethanol, the results showed. But at the branching point leading to gorillas, chimps and humans — which represents an ancestor that lived roughly 10 million years ago — the enzyme becomes a powerful alcohol digester. Compared with earlier enzymes, this one was 50 times as efficient, Benner reported, and was nearly capable of breaking down the level of ethanol found in modern alcoholic beverages. Because gorillas, chimps and humans all spend at least some time on the ground, Benner thinks a terrestrial lifestyle arose in these primates’ common ancestor around 10 million years ago. Being on the ground, the ancestor would have come across fruit that had fallen from trees. With a damaged husk or skin, yeast could have invaded the fruit and fermented its sugars into ethanol. Thus, individuals who could digest ethanol would have survived better than those who couldn’t. This would also explain why the ability to metabolize ethanol didn’t evolve in tree-dwelling primates like orangutans that rarely encounter fermented fruit.